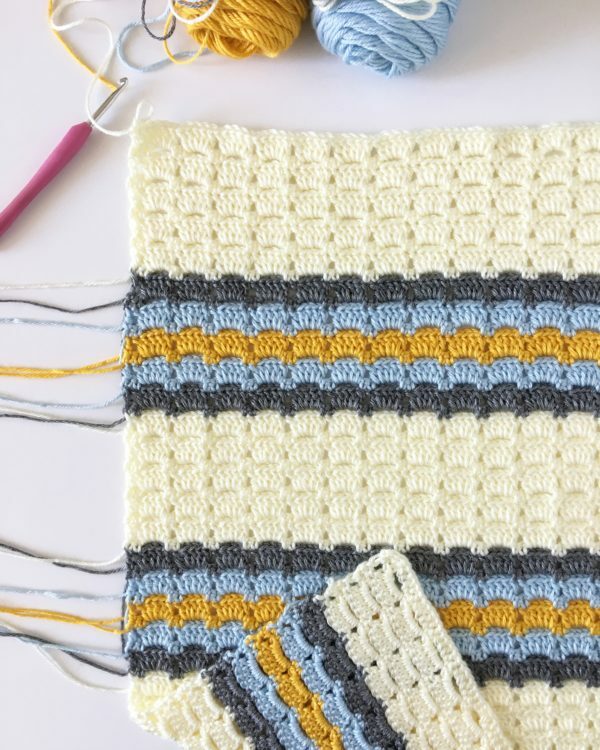 This crochet boxed block stitch blanket started with research of vintage stitches. 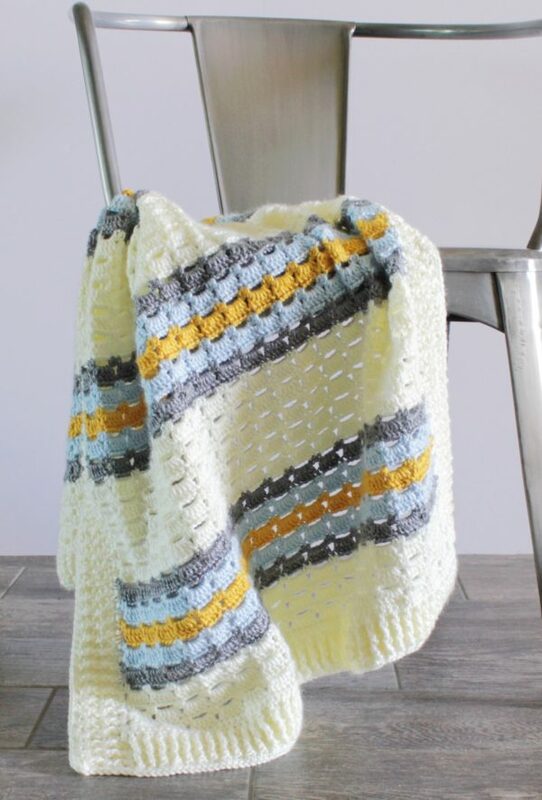 I wanted to make a baby boy blanket using soft blue adding a touch of retro mustard and gray into the mix. But I wanted a classic stitch to accomplish the look. I saw this boxed block stitch in several old crochet pattern books, so it’s just my assumption that it had to have been developed years ago and passed down through time. Either way, I like how my blanket turned out and I’m happy to share what I did if you’d like to make one too! Caron Simply Soft Yarn (Found at Michael’s, WalMart, JoAnn’s, or online at Yarnspirations.com) One skein in Gold, one skein in gray heather, one skein in soft blue, 3 skeins of off-white. ROW 1: SC in the second chain from the hook and in each stitch across. ROW 2: CH 1 and turn. *SC in the first two stitches, CH 3, skip the next three stitches, SC in the next two stitches. * Repeat * to the end. Your last two stitches will be two SC in the last two spaces. ROW 3: CH 3 and turn. DC 5 into each space that the chain 3 made all the way across, skipping over the first two SC and all others, just work into the space made by the chain 3’s with 5 DC. End with one DC in the last SC of the row below. CH 1 and turn. ROW 4: SC in the first two DC, *CH 3, skip over the next 3 DC, SC in the next 2 DC*, Repeat * all the way across, your last two stitches will be two SC in the last two spaces. Here is how I worked the colors: I started with the off-white and used it for the first 3 “boxes” changing to gray when I worked the SC 2/chain 3 row. I worked back across, making the boxes, then changed colors to soft blue. I did not cut the gray, to save time and eliminate a number of ends needing to be woven in, I carry the yarn up the sides in this color section.) I worked one set of “boxes” with the soft blue, changed to gold for one set, back to soft blue, and then final color change back to gray. Then, I worked 5 sets of “boxes” in off-white before repeating the color section again. I have 4 sets of color sections with 5 sets of off-white, with the exception being that the first blocks of off-white are only 3 rows. Pick either side to work across. Using off-white, pull up a loop in the corner and chain 3. DC across the entire side working 2 DC into the side of each DC post and one DC into a SC. Chain 3 and turn. This counts as your first DC. Work back across the row of DC you just made alternating working into the front post, and back post of each DC (FPDC, BPDC) When you get to the last DC, work that one as normal-into the top of the stitch. chain 3 and turn. Repeat this back and forth for 2 more rows for a total of 5. Do not tie off, simply chain 3, and start working across the end of the blanket, working 2 DC into the sides of the DC stitches, one DC per SC and then into each SC that is at the end of your blanket. Chain three and turn and work back across in the same manner you did for the sides using the FPDC and BPDC. When you finish 5 rows, chain 3, and now work in the same manner up the side, again working 2 DC per DC stitch and one per SC. When you finish working the ribbing up this side and then across the last end, chain 1 and work a SC into each DC all the way around the entire blanket. Tie off and weave in the ends. Block the blanket if needed by either hand washing and then reshaping and laying it out to dry, or simply use a spray bottle. I have found that using the Caron Simply soft does not require pins to block, just reshaping with my hands and letting it dry does the trick. Come and find me on Instagram (@daisyfarmcrafts) and tag me with your crochet project! I’d love to see how your blanket turns out!